As I mentioned before, I’m not great at finishing crochet projects. I started and abandoned three or four baby blankets while I was pregnant with Evie. So when I was pregnant with Mira, I wanted to start a blanket for her, but felt I should make one for Evie first. I picked out this pattern and plowed through it pretty quickly. But when I laid it out, I wanted it to be a lot bigger. When I realized I needed at least twice as many as I had already made, I was so discouraged that I had to put it away. Fast forward to months after Mira’s born and I finally decided to resurrect this project and finish it. 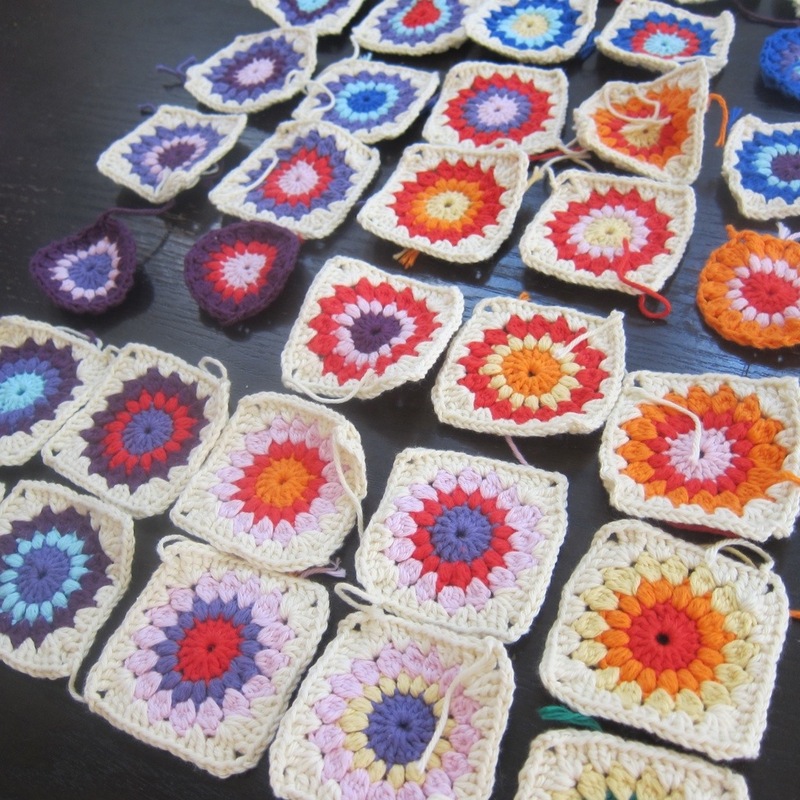 I’m making every square different, so I have to keep checking to make sure I’m not repeating a color combination. 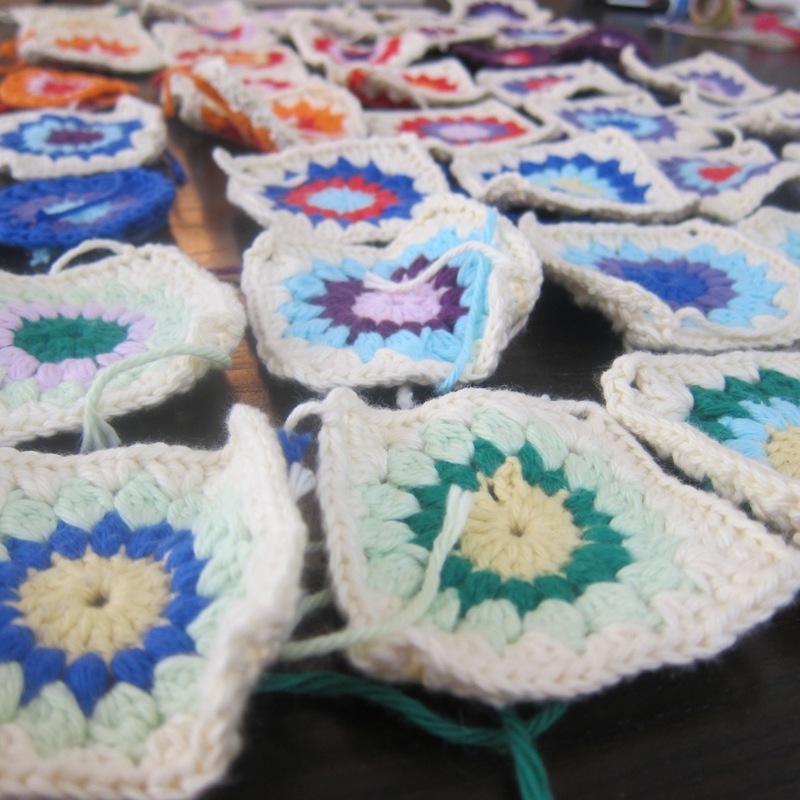 I started working on the squares during nap time and they are going pretty quickly. Hopefully I can finish them pretty quickly and get through the dreaded task of laying out the order of the squares, attaching them all, and weaving in the ends. We’ll see if I can keep motivated long enough to finish it, or if I’m going to stash it away for a few more months. At this rate Mira might not get her own blanket until she’s in college. My dad did a needlepoint stocking for my older brother’s first Christmas. Mine was about 90% done for almost 30 years, I finally received it a couple years ago! My younger brother has no hopes of getting one! Luckily my mom is quite the knitter and has knit several things for us all, including stockings! Good luck, I have several unfinished projects, I usually stick to hats…those I can finish! That makes me feel better! Especially because this blanket still has a very, very long way to go!